I can’t believe Chanuka is more than half over. Where did all those days go? And could you believe I haven’t posted anything fried yet? 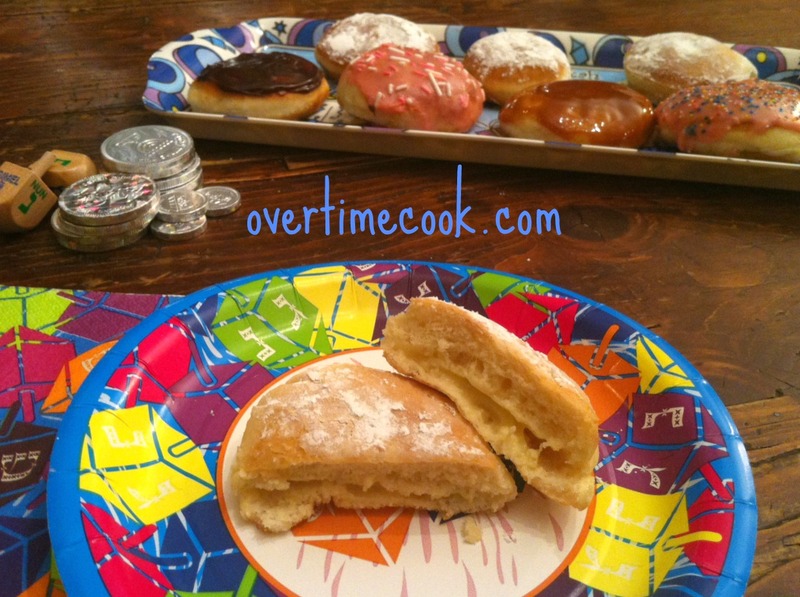 Well, never fear, I have a delicious donut recipe to share with you. Isn’t there always time for one more batch of donuts? Here’s the thing about making donuts: people seem to think they are ultra complicated, something to attempt only in your most ambitious moments. But I am here to tell you that donuts are totally easy- or at least they should be. 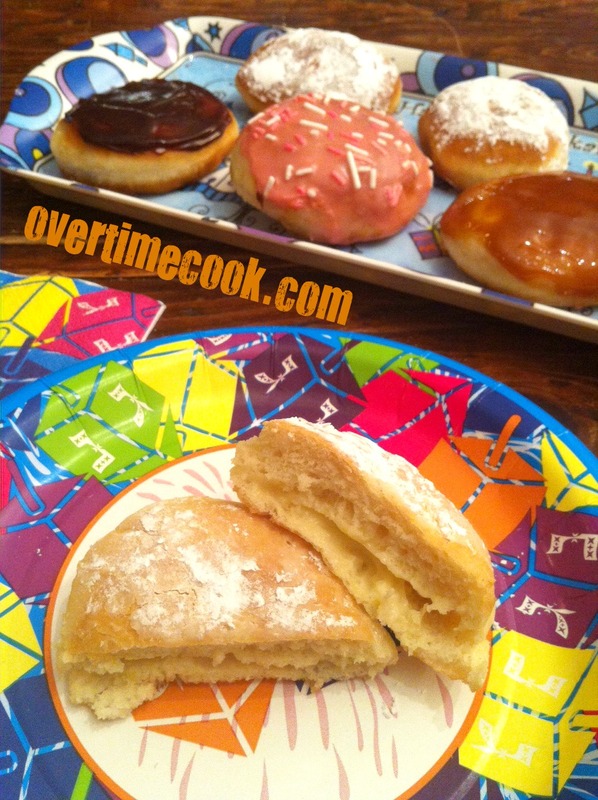 I’m usually the queen of making things from scratch, so I had to seriously resist the temptation to make my own caramel sauce for these, but let me introduce you to my awesomely fun donut topping method. I’ve been doing this for years, and people love it. I prepare a selection of toppings, then bring the donuts out straight from the frying pan, and let my guests make their own combinations. This year I made a simple glaze (confectioner’s sugar mixed with oil and water). Because I am the coolest aunt ever, I split the glaze in half and let two of my nieces pick a color. They had such a good time mixing the coloring into the icing! I also bought caramel sauce, chocolate caramel sauce and custard. Then my nieces had a great time picking through my box of sprinkles and other decorating stuff (doesn’t everyone have a big box of different shaped and colored sprinkles? No? Maybe that’s what makes me the coolest aunt ever). We put out little bowls of the different sprinkles and toppings. When the donuts were ready, I brought them out and everyone had a phenomenal time designing their own donuts- fresh hot out of the frying pan! In a large mixing bowl or the bowl of an electric mixer, dissolve yeast and sugar in 1/2 cup water. Add remaining ingredients and knead until smooth. Cover dough and let rise for 30-45 minutes. On a floured surface, roll out dough to about 1/4-1/2 an inch. Allow to rise an additional 30 minutes. Meanwhile, in a large skillet, heat about 1 1/2 inches of oil. Serve hot with confectioner’s sugar, caramel sauce, custard, glaze sprinkles, or your favorite donut toppings. These are so pretty. You are the best Aunt ever. Thanks! These were awesome. By the way, just for the record, Miriam sure knows how to throw a party! Oh these were awesome…. so awesome that I caved in and tasted one….. well worth it!!!! yum! look amazing-love the donut buffet idea! I am impressed!! Latkes seem easy in comparison! They look delicious. Thanks Irene, and happy new year to you, too. I have a weakness for doughnuts and yet a weakness in making them. I so bookmarked these! Thanks for this recipe!! YUM! Thank you for this great recipe! Anyway to make these gluten free? You can experiment with gluten free flour blends. I haven’t tried it though, so I can’t make any guarantees. These look great. Can you fill them? Looks amazing, how many donuts does this receipe make?